Developer-publisher Midway has taken another loss for the fiscal first quarter of 2008, the company announced today. 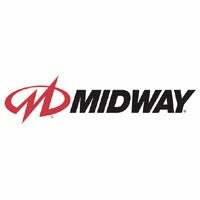 The company saw $29.9 million in sales, more than twice its performance for the same period last year, but nonetheless, Midway's first quarter net losses were $34 million, while it lost much less - $19.8 million - in 2007's first quarter. The sluggish performance can be credited to the fact Midway had only one U.S. release during the quarter - an expansion pack for Stranglehold. On the other hand, its European launches included Unreal Tournament 3 and BlackSite: Area 51 for the PS3, Game Party and Cruis'n for the Wii, Foster's Home for Imaginary Friends for the DS, and Hour of Victory for the PC. Looking ahead to next quarter, Midway expects the release of NBA Ballers: Chosen One for Xbox 360 worldwide and for PS3 in North America to support $18 million in sales. Also on the road ahead for Midway, the company hopes to reap the benefits of a recent executive reorganization as it fired CEO David Zucker and replaced him with interim president and CEO Matthew Booty. The company also promoted Miguel Iribarren to senior VP of Publishing and Martin Spiess to the role of executive VP of its Midway Games Ltd. subsidiary. The company's investor call marked Booty's first outing speaking to the investor community. Booty said he's been with Midway his entire career, most recently as VP of Worldwide Studios, and that his two goals now are to deliver a solid 2008 lineup and to put the company back on the path to profitability. "My intent is to improve execution on a number of fronts to deliver on the commitments we've made to quality," he said. At its recent press event in Las Vegas, Midway announced Mortal Kombat vs. DC Universe for Xbox 360 and PlayStation 3, and the troubled publisher is clearly hoping it, along with This is Vegas, TNA Impact!, The Wheelman Unreal Tournament 3 for the Xbox 360, and Blitz: The League II. The company seems to be hopeful that the new lineup and the fresh executive leadership will help put the troubled publisher on track for brighter days. In fact, Booty said that the initial revelation of Mortal Kombat vs. DC Universe garnered enough attention when it was announced to knock GTA IV off of the top position on Gamespot, and the trailer took the number one spot on GameTrailers. He promised further information on the game leading up to an anticipated launch in the fourth-quarter of 2008. When asked why Stranglehold and Blacksite suffered critically and commercially, Booty said that the success of a game depends not only on its quality, but on the timing and manner of its launch, including surrounding marketing efforts. Essentially, Booty said the releases suffered from poor timing, but expressed confidence that they've resolved their timing issues for the 2008 lineup. Finally, will Midway consider bringing more titles to the Wii as a way of capitalizing on its broad install base? "In terms of bringing some of those PS3 and 360 games out for the Wii, I think the games that are successful on the Wii are made specifically for the Wii in terms of audience and technology," Booty said. "Where appropriate - for example, we've brought some of our Mortal Kombat titles over to the Wii - we'll take a look at it."